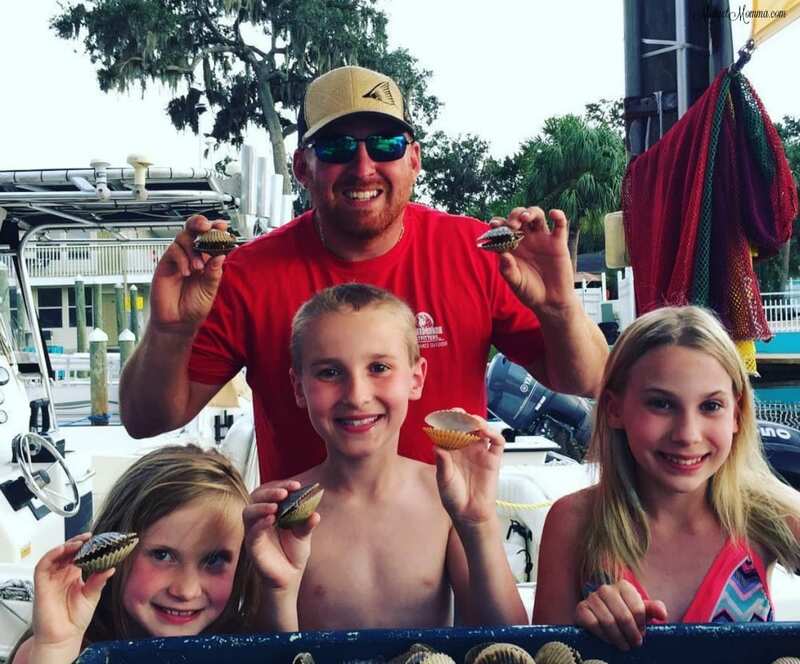 Scalloping in Crystal River Florida might not be at the top of your list of things to do in Crystal River Florida, but I am telling you that it is something you should add. 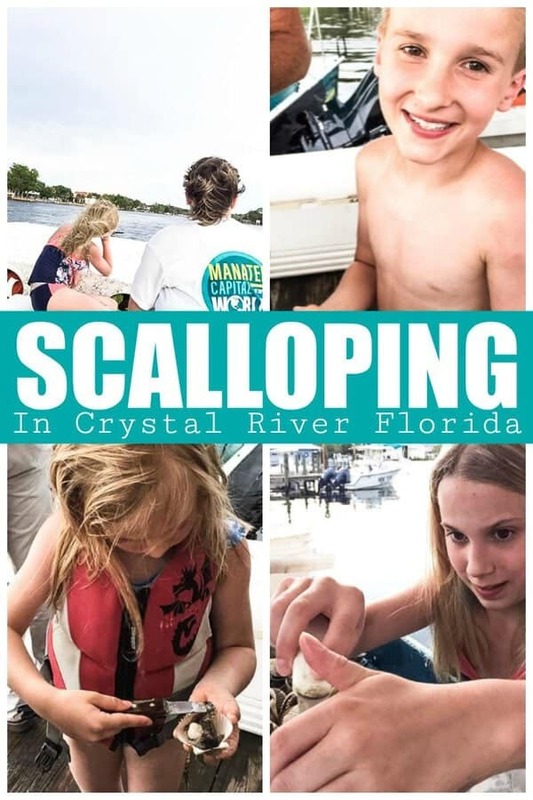 The kids all loved scalloping in Crystal River Florida and being able to see just how everything works to get scallops from the sea to the dinner table. 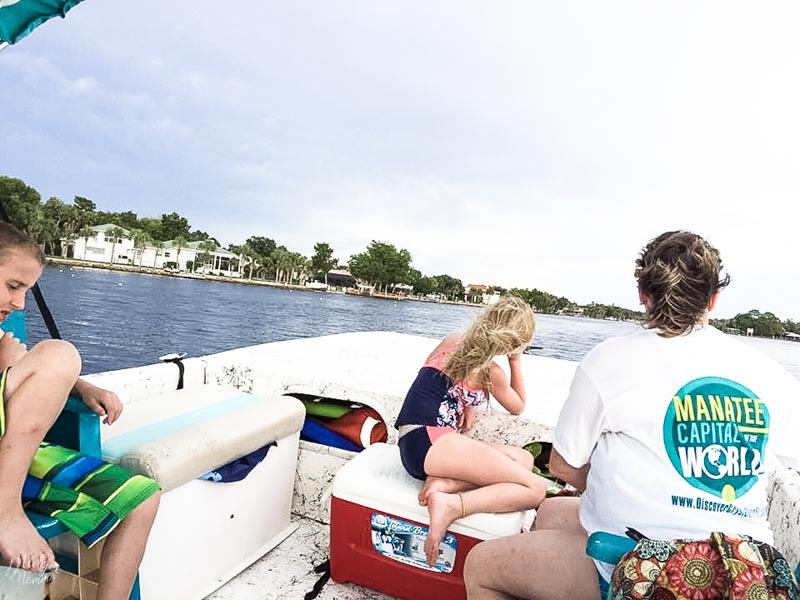 For our scalloping adventure, McKenzie, Logan, Alyssa, my Mom and myself partnered with River Adventure Tours. Tom, my Dad and Hannah went on their own adventure hanging out at the hotel. We all loved our guide, he was the most AMAZING Tour guide ever! He calmed our fears about how we were going to actually get scallops. He explained the whole processes to us, and let us know that if we could not get enough scallops to fill our bucket, not to worry because he would make sure we didn’t go home empty handed. The thing with scalloping is that you are diving down in to water that is roughly 6-10 feet deep or more. At first you think oh, that is no big deal. Until you are in the water, with flippers and a snorkel and attempting it. It is HARD! He made it look so easy and was totally patient with us and it being our first time. My mom was the most adventurous one of us and the kids. We got to one section of the water that was a bit rough, and she jumped right on in – the kids and I waited a bit to get a feel for how the water was. Let me tell you though, my mom has come a long way since I was a kid. When I was growing up there was no way my mom would have jumped off a boat, into the water to go get scallops. It took me quite a few tries to get to the bottom of the water and finally get a scallop. But I did it and I got ONE! Yes just ONE, but hey it was an adventure and a TON of fun! Once we were done scalloping, or should I say our amazing guide was done for us. We took a short ride over to an area where we could all get out and enjoy the water. The kids LOVED being able to get in the water, swim a bit and relax. Plus the water was the PERFECT temperature ever! After our swim, we headed back to River Adventure Tours but not with out a totally fun stop along the way! We stopped at one of the “on the river” shucking booths. I mean, it literally is on the water. You pull your boat up to their dock and on the dock right there in front of you the shuck your scallops for you! 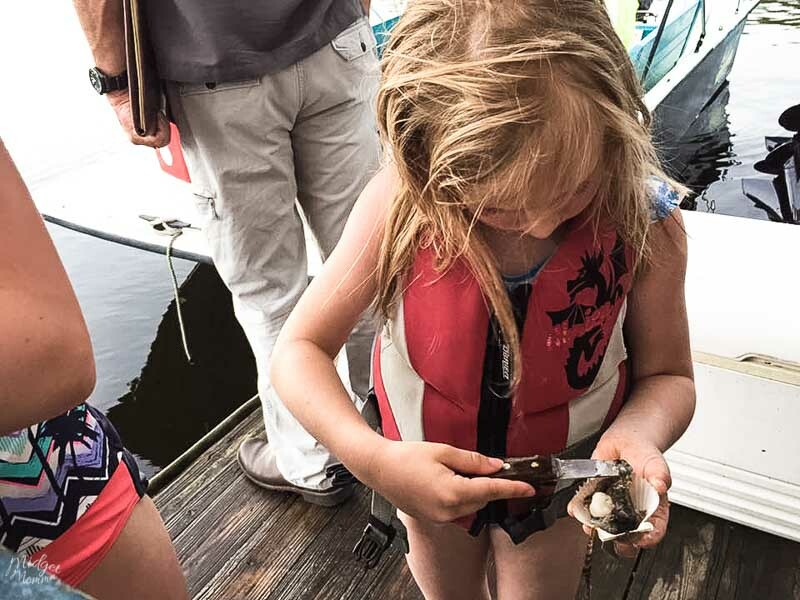 If you are lucky like we were, they will let the kids help and you might even be able to taste a raw scallop! Which are sooooo GOOD! But don’t eat them all because you are going to want to cook them up and enjoy them! There are even some restaurants that you can bring your fresh shucked scallops to that will cook them up for you! 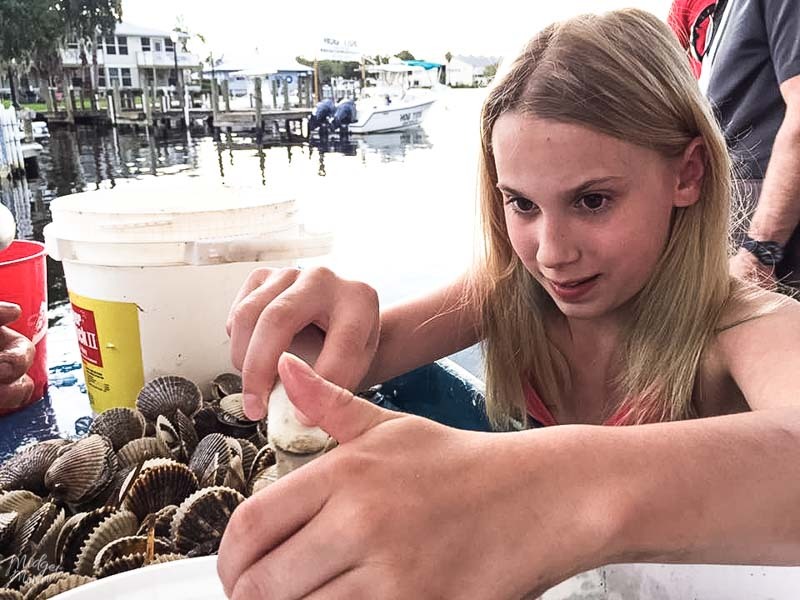 If you are looking for a fun and semi crazy adventure that the whole family will love, then scalloping in Crystal River Florida needs to be on your bucket list! 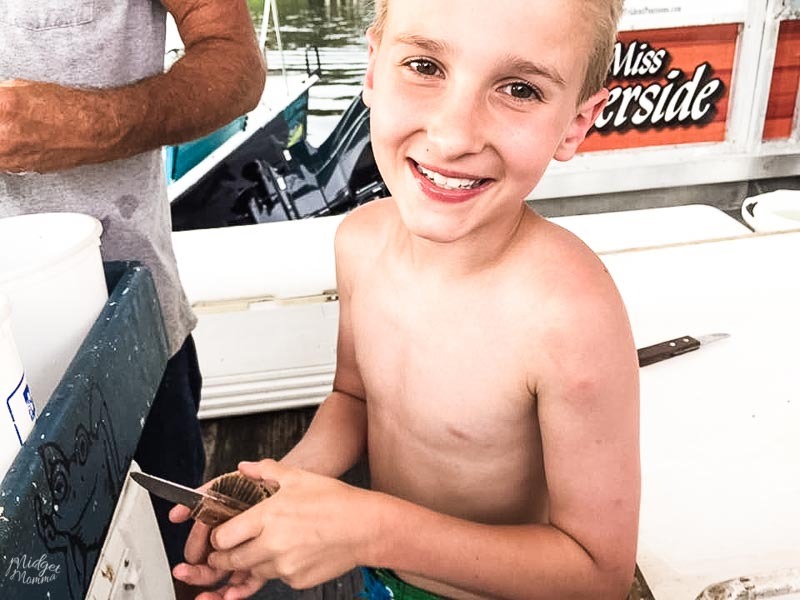 It would be a good new experience for kids, especially the young ones to learn about these scallops and have fun getting a catch the easiest way.